Although the Ovation B768 Elite is designed primarily as a fretted acoustic/electric bass guitars, it’s a great alternative for players who something that approaches an upright bass’s sound without presenting the inconveniences of a fretless neck and unwieldy size. As it sounds great unplugged as well as amplified, it’s also ideal for low-volume gigs that don’t require an amplification system. Many acoustic bass guitars sound somewhat lifeless and don’t put out too much volume due to their relatively small body sizes. Somehow, Ovation has overcome this problem; the Elite have a body that is only slightly larger than a standard acoustic guitar’s yet it produces loud and lively, resonant sound. This may be partly attributable to the Adamas-style epaulet sound holes, which are of various sizes and spaced across the instrument’s upper bouts. This design retains as much of the solid sitka spruce top’s material as possible, and keeps a solid section of wood underneath the strings to ensure optimum top vibration. But the Elite also produces outstanding acoustic-electric tones thanks to its built-in OP-X preamp system and piezo pickups mounted to individual string saddles. The preamp is fully loaded, including a gain control with bypass switch, notch control with bypass switch, and EQ cut/boost sliders (Low, 600Hz, 6kHz and High). The gain and notch knobs pop up for easy adjustment and snap down into a recessed cavity where they won’t dig into your chest or get knocked around. The preamp is powered by a single 9-volt battery that is housed in an easy access battery compartment next to the preamp’s controls. The Bass’s 5-piece laminated maple and mahogany neck is exceptionally stable, and features a manageable 34-inch scale, although its 24-fret neck, single cutaway and center-mounted rosewood bridge make it seem much longer. The rosewood fingerboard is so dark and tightly grained that it seems more like an expensive slap of ebony. Although the fretted neck prevents the instrument from providing true upright tones, players will appreciate the feel and intonation of the Elite’s fretwork. The Elite is a great option for upright players who want to play bass without plugging in. 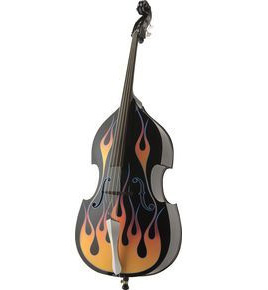 It’s also a great transitional instrument for bass guitarists who want to explore acoustic textures without the hassle of learning the techniques required to play an upright.